Registration/check-in times and locations will be specified for each camp. Once checking in campers, family may remain at the fields to watch practice. Dismissal will also be designated for each individual camp. Parents are advised to arrive early for check-out, taking traffic into consideration. Dismissal/check-out times and locations will be specified for each camp. NCAA rules prohibit payment of camp expenses (transportation, camp tuition, spending money, etc.) by representatives of the University of Georgia’s athletic interest. Furthermore, NCAA rules prohibit free or reduced camp admission privileges for prospects in the 9th grade or above. Refunds for leaving camp early will be reviewed case by case. Pro-rates are available upon request. With homesickness and lethargy, typically no refunds are given. Campers must be protected by personal medical insurance. Additionally, by May 1, 2019 or at check-in, each camper must present a copy of a physical (done within the last year) or a physician’s signature on our camp form stating that the camper has been examined and is physically fit to participate in camp. A certified athletic trainer will be on hand at all times. Athletic trainers are housed in the dorm for overnight camps. Campers will be housed with other campers their own age (if they have not requested a roommate). We will make every effort to honor a camper’s roommate request. We can only place 2 campers in each room. If you have a group of campers who would like to be roomed on the same hall, please get that list of names to Ann Hunt no later than May 1, 2019 (ahunt@sports.uga.edu). Campers may bring money for snacks, but keeping up with the money will be their responsibility. Unless coordinated in advance, campers will not be permitted to leave camp. Overnight campers driving to camp will not have access to their car during camp and will need to purchase a parking pass for $15 at check-in. Workout gear necessary: Helmet (High School and Youth Camps) cleats, tennis shoes, practice shirts and shorts. Compression shorts are recommended. For Specialist Camp, Kickers please bring 2 footballs (if you have them), 1 kicking tee, a kicking block OR kicking tri-pod, kicking shoes and workout attire. Helmets are optional for everyone at Specialist Camp. Wifi is not available in the dorm or football facility. Any prescription medication, medical questions/information/instructions can be given to our Sports Medicine staff during the check-in process. Water and sports drinks will be provided for all campers throughout camp. However, the camper is welcome to bring a water bottle. Campers are welcome to bring snacks (there are also vending machines at the dormitory for overnight campers). Campers may want to bring a bag or tie sack to keep phones, sunscreen, dry socks, etc. in during the day (personal items brought to practice can be secured in team storage bins). A Kirby Smart Football Camp t-shirt will be provided during camp. Open to individuals in high school (rising 9th – 12th graders), preparatory school students, rising sophomores in junior college and 4-year college transfers. This camp is formatted around 4 practices. Between practices, campers will also watch highlight videos, tour Sanford Stadium, and play in games. **IMPORTANT** A copy of a current physical (one completed within the last year) is required to be able to participate in this camp. This camp is designed for punters, place kickers and long snappers. Kickers and punters will focus on both fundamentals and competitive situations. Snappers will be coached on accuracy, timing, and consistency. Open to youth, ages 8-14 up to rising 8th Graders (must be 8 years old by June 6). 7 on 7 camps are TEAM camps open to high school teams with participants entering grades 9-12. Teams must be pre-registered in order to participate. 7 on 7 camps are not available for online registration. **IMPORTANT** Each team will be required to submit a current physical (one completed within the last year) for each participant. This camp is not available for online registration. 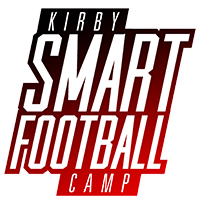 The Kirby Smart Football Camp is a non-contact camp formatted to simulate the exact practice routine of the Georgia Bulldogs. Each camper will receive hands-on instruction at this skils-teaching camp. Coaches will focus on developing football fundamentals and improving the position specific technique of each participant. Campers will receive the same expert coaching that every Georgia player receives in drills and practices. IMPORTANT: A copy of a curent physical (one completed within the last year) is required for each camp participant. ALL CAMPS ARE OPEN TO ANY AND ALL ENTRANTS, LIMITED BY NUMBER, AGE, GENDER, GRADE LEVEL OR CAMP SIZE.